It might be simple to close a Facebook account, but permanently closing other online accounts can be surprisingly difficult. Online companies regularly utilize dark patterns – design and procedural techniques that make it difficult to quit – to keep you as a customer. You could sooner check out of Hotel California than get WordPress to delete your account. Thankfully, out of necessity comes invention. 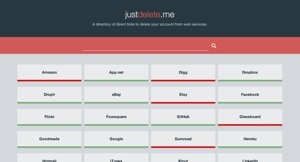 Meet justdelete.me, a simple website with a purpose: to make it as easy as possible to close various online accounts. Want to close your old unused PayPal account? Just click its button on the justdelete.me front page, and you’ll be taken to the company’s account closure page. Services are color-coded based on the difficulty of the deletion process: green for easy, red for difficult. Not only will justdelete.me help you close out your old, unused internet accounts, but it will also help you understand how the process works for each company and just how deleted your data will be. Before you can delete Skype, for example, you’ll need to know 5 contacts, the month you created your account, and the email address you used to sign up. If an account can’t be deleted (as is the case with WordPress), justdelete.me will give you advice about removing identifying data. It may be tempting to just abandon old Internet accounts. But it’s a bad habit given how notoriously bad corporate America is at protecting your privacy. And while a permanently closed eBay account is harmless, an abandoned account with positive feedback can be a goldmine to a hacker looking to scam innocent sellers. The only thing worse than an online scam is one being perpetrated in your name. When justdelete.me launched earlier in the week, the service offered account deletion info for 16 companies; that number has since swelled to 40. Considering that creator Robb Lewis has offered to add more services upon request, justdelete.me is an incredibly simple and useful site worth bookmarking for the future. GoDelete/justdeleteme.com is simply a rip off of http://justdelete.me. It was created three days after justdelete.me purely to cash in on the press coverage we were having. We have a far greater number of services listed (278 at the time of posting this) and are actively updating the site. We removed the links in the comments above since those copycat sites are questionable from a security and functionality standpoint (and we just don’t like copycats and comment spammers). Thanks for the quick response, appreciate it!